Need help choosing a name for your baby? Chooze claims to understand your subconscious preferences to help you choose the name you REALLY want. Fact: Lots and lots of parents experience baby name regret...and if you think about it, that's not so surprising. There are plenty of factors that can influence your ultimate pick: Celebrity baby names, phonetic trends, and opinions from your own friends and family, to name a few. With all that white noise, it can be tough to figure out what you really want to name your baby. That's where this Israeli startup comes into play: Newly launched app Chooze relies on cognitive psychology to reveal your subconscious name preferences. It might seem like a strange concept—after all you would think you know what you like better than any app can—but it makes sense if you think about it. If this app can force you to cut through the trends and opinions of others to figure out what actually feels right, well, it could very well help you avoid that regret down the line. Here's how it works: The app prompts users to choose two or three baby names they're considering and two or three they dislike—the app figures out which associations the parents have with each, and this can help you narrow down your choices. After leading you through a series of prompts, the app identifies the name you should choose. 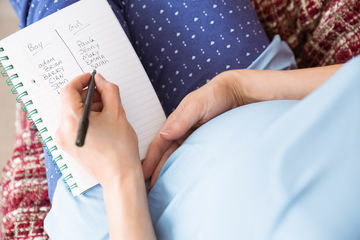 "Baby names are a challenging journey for every expectant parent and there's never been any technology that helps them pick. Chooze helps parents navigate the top names they're considering and feel more confident about a decision that will affect them each and every time they say their child's name," says Chooze's co-founder, Ittay Hayut, in a release for the app's launch. "When my oldest daughter, now 15, was born, we couldn’t make up our mind. She actually left hospital without a name. And stayed nameless for over a month. Like many (most?) new parents, we were torn between all sorts of ideas, and simply couldn’t make up our mind," Ran Hassin, PhD, who is one of the App's co-founders and a famous cognitive scientist, tells us Fit Pregnancy. "Chooze is inspired by well-known and well-examined methodologies in experimental psychology. It allows us to estimate which name you find more attractive on an implicit, non-conscious level." What do you think of this? We say it could be a good way for couples who can't agree on a name to finally put the conversation to rest. Will you be using using this app?